The KZN Department of Sport and Recreation backed Elite Athlete Development Programme, produced stellar results at the first major river canoe marathon of 2018 when their athletes, Andy Birkett and Jenna Ward, won their respective titles at the N3TC Drak Challenge recently. The 2018 event was unprecedented in terms of water levels with the uMzimkulu’s level being the lowest it has ever been in the 25 years that the race has taken place. Despite these testing conditions EADP athletes filled two of the top three spots in both the men’s and women’s showdowns. Ward, who finished third twice and second once in the previous three editions of the Drak Challenge, finally broke her duck when she dominated the second and final day to take the win over a chasing Robyn Owen. The Euro Steel star, who is targeting a maiden FNB Dusi Canoe Marathon win in February, continues to be full of praise for the EADP team that supports her constantly. “The EADP is honestly one of the best kept secrets in Durban,” she said. “The work that the trainers, doctors, physiotherapists do behind the scenes in incredible and I know that the support that they provide is crucial for me. “I see Jarryd Rudolph twice a week every week and he is so knowledgeable which means that I can concentrate purely on being ready for my next race. In recent years the EADP has supported a number of the nation’s best marathon paddlers, whether it be flat-water or river marathons with the likes of Ward, Dusi superstar Andy Birkett, multiple World Champion Hank McGregor and Olympic bronze medallist Bridgitte Hartley. “I know that Jarryd works with a lot of paddlers at Prime but we are all looked after individually. “We have training programmes set up to cater to our needs. This individual care from our trainers gives us that edge when it comes to racing. “I do feel that being on the programme definitely gives us the edge over the rest of the competitors and the professional approach gives us the upper hand,” Ward added. Coming home in third in the ladies race was fellow EADP athletes Bridgitte Hartley while the young Christie Mackenzie, who was the first Under 23 lady, finished in fourth. These results meant that the EADP occupied three of the top four positions. 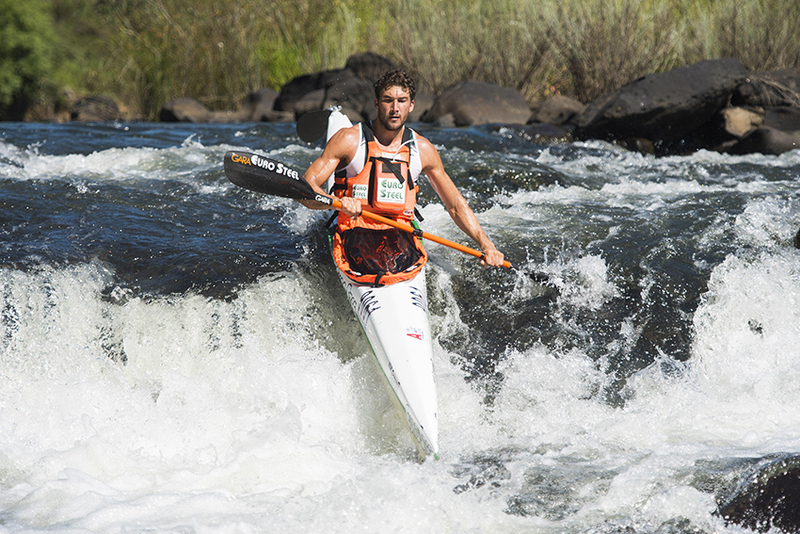 The men’s race produced just as impressive results with Andy Birkett taking home is fifth Drak title in a row. He equalled Ant Stott’s record of five wins. Finishing behind him was the ever-green Hank McGregor who was just over three minutes behind Birkett. Coming home in sixth overall, at a race he doesn’t see as his strength, was Sbonelo Khwela. Director of the High Performance at Prime HPI Dennis Jackson explains the role that the programme plays in preparing paddlers, and other athletes, for the busy river marathon season that they find themselves in. “The EADP provides athletes with funding for High Performance Testing, Training and medical needs. This can be used for appropriate recovery and maintenance sessions,” Jackson mentioned.